Mark Debolt brings a contagious energetic passion for hair coloring in his Master Classes at Samuel Cole Salon. 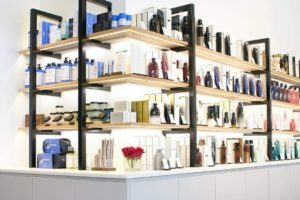 As a Wella Master Colorist, he is consistently innovating hair color techniques and formulations. This Master Class focused on brightening around the face – getting the perfect “money piece” – and subtle foil placements that can compliment balayage techniques. Mark’s commitment to his craft and his color expertise is always inspirational. Carla “Coco” Kootsillas, 2016 Wella Trendvision Runner Up, introduced the color mega-brand’s Spring – Summer 2017 Trend Inspiration: Ultra Contouring by Optical Illusions. The trend expands the scope of the selfie culture, toward ultra personalization. This Spring we will see people embracing brave and bold individuality, pushing to intensify their personal character, and going daringly and deliberately beyond a standardized beauty. 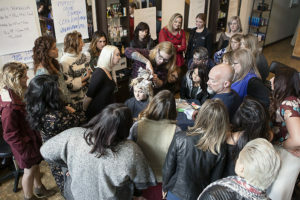 After introducing Wella’s trend forecast, Kootsillas facilitated a hands-on session in which Samuel Cole stylists consulted with and created custom formulations and application techniques for their models. Kootsillas personalized her feedback and coaching based on each group’s model and stylists’ levels of experience. Samuel Cole’s culture is deeply rooted in education, and features monthly advanced learning opportunities for its team. See more photos from this class here. Wella Professional Ambassadors , Educator and Hair Color Expert Mark Debolt energized stylists in his Master Color class at Samuel Cole Salon. He shared his style of conducting a successful color consultation and demonstrated application techniques and custom color formulating based on models and their natural hair color. 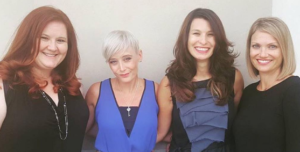 Stylists especially appreciate Debolt’s Question-and-Answer style of teaching; stylists ask candid genuine questions and Debolt’s answers are specific and informed. His passion for hair coloring is absolutely contagious. 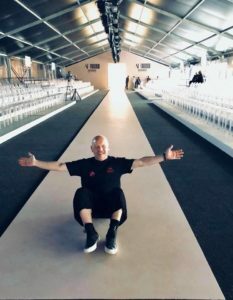 Wella TrendVision winner Nicole Obert is a master of cutting, coloring, and styling, who began her career assisting renowned celebrity stylist Nick Arrojo. 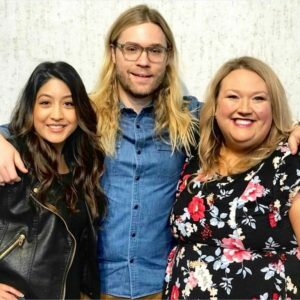 Obert’s master class at Samuel Cole Salon, featured signature Sassoon-style haircuts and a hands-on session for balayage coloring (hair painting). Obert demonstrated three color transformations – a blonde, a brunette, and a strong red – using custom techniques for each model. She formulated a glaze to brighten a dull blonde and finished her look with a structured bob haircut. 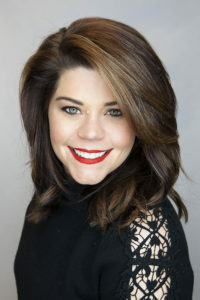 She took a golden brunette to a bold copper red with a custom formulated glaze, and in her final demonstration, transforming a dark to sun-kissed brunette with surface balayage highlighting, she invited each stylist to perfect the technique on a model. Working one-on-one with each stylist allowed Obert to provide individual feedback.